Pretty soon I’m going to be known as that “wreath chick.” HA! Well, this 45 wreath isn’t going to help that nickname. This wreath is going to the lovely occupants over at the Bluish Barn in Ann Arbor. 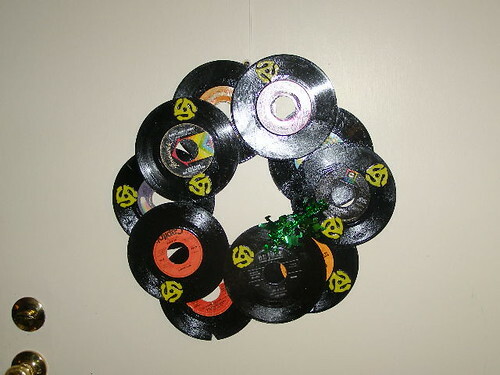 Keeping with my need to recycle supplies and designing on the cheap, here’s how to make your own wreath-o-tunes! 1. 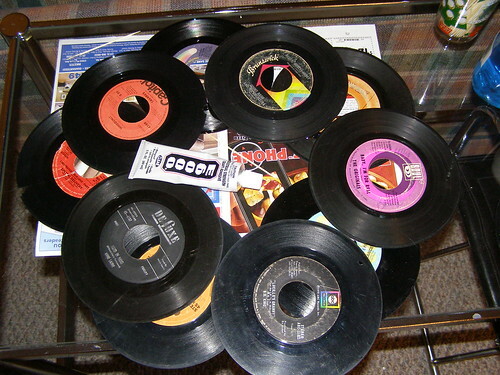 Start with some CLEAN, used 45s that can no longer be played on a turntable, but shouldn’t be thrown out. I used 10 for this wreath. I started by placing two next to each other, and one on top, continuing the repeat pattern until the circle was complete. 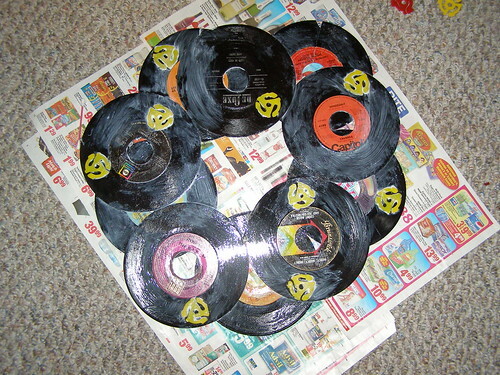 I used E600 craft adhesive to glue the records together- I’d avoid hot glue, as these are pieces of vinyl! 2. Continue staggering the records until you reach the size/shape of wreath you’d like. 3. Let the wreath sit for anywhere from 24-72 hours. The drying time will vary based on climate, weight, etc. 4. Apply decorations and seal. I used 45 inserts for some “color” and used Mod Podge, a craft-friendly sealant, over the entire wreath so that it could go outside. 5. The final step: HANG IT UP! I used fishing line to hang it up since it’s strong, can go outside, and is invisible. I promise, my next big project WON’T be a wreath! 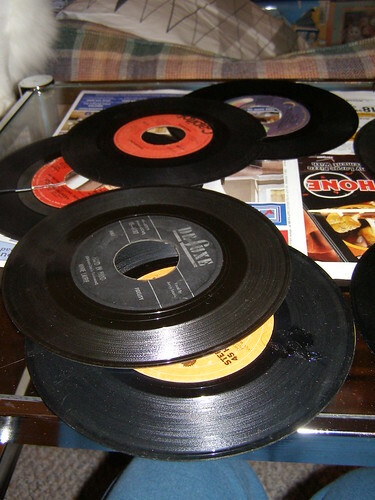 what a stupid idea and waste of vinyl, some of them records even in seemingly poorish condition could be worth 100s of $ to collectors. 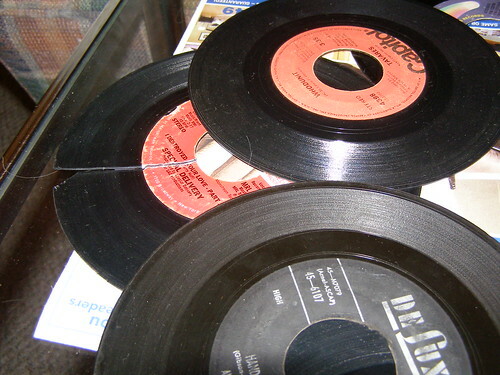 Hey Danno- Actually, since I collect vinyl, I used records that were cracked or scratched beyond playing. Sorry you didn’t like it. i absolutely love it! my boyfriend is a reaggae dj and has 1000′s of 7″‘s! i make insert earrings and people love em! i think i might make him one of these for christmas! thanks for the great idea! Good job staying on bedgut!!!! Do you still have the Jepson ornament we bought at Mary wash a long time ago?? Or I remembering a false memory I saw the cheap wreaths at trader joes!! Gosh trader joes is the best!